The original band MAZARIN, are often referred to as �Long Island musical legends� & �Those Slaves to Rock and Roll� . MAZARIN & The OK Club continue to entertain & set record attendance levels now, into their third decade! 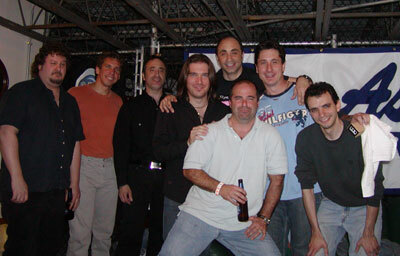 MAZARIN was a featured act at the1991 South by Southwest Music conference. Their seven-year run at The Rumrunner of Oyster Bay is unprecedented in the annals of NY Rock history. Recent performances to overflow crowds at The Legendary Memory Motel in Montauk, NY have generated reviews describing the band as �Classic Rock Heaven� . 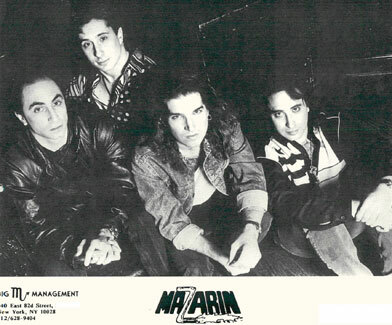 MAZARIN was awarded "Best Rock Band " by Good Times Music Magazine 1982-1986. MAZARIN has shared the stage with the world's top music acts and has performed thousands of shows in front of hundreds of thousands of loyal fans. Recordings such as Slave to Rock and Roll , The Only One , Rockers and I Can't Deny received frequent play list rotation on college and major market rock radio. Slave to Rock and Roll hit number 7 on New York 's WRCN! MAZARIN recordings were produced by Steely Dan master engineer Roger Nichols , Blue Oyster Cult's Clay Hutchison and Tiki Studio's Grammy nominated Fred Guarino. The band had the distinction of being included on numerous 1980's compilation collections that featured Bon Jovi , Zebra and Twisted Sister . A greatest hits �Studio� collection is currently set for a 2006 release. Dan Lazarus, Roger Nichols and Doug at The Mazarin sessions at Soundworks. First Class Records. Producer Clay Hutchison (Blue Oyster Cult). Recorded Kingdom Sound. Guest artist - Ritchie Canata, Saxophone (Billy Joel Band, Beach Boys). First Class Records. Producer Clay Hutchison (Blue Oyster Cult). Recorded Kingdom Sound. First Class Records. Producer Fred Guarino. Recorded Tiki Studios. First Class Records. Producer Roger Nichols (Steely Dan, John Denver). Recorded Cherokee Studios LA/Soundworks NYC. Guest Artists - Jim Keltner - Drums (Traveling Willberrys, Tom Petty), David Hungate - Bass (Toto). Voted New York's Best Rock Band 1982-1986, Good Times Magazine "Goodies awards"
New York's SXSW finalist Austin, Texas 1991 Performed at UT at Austin.